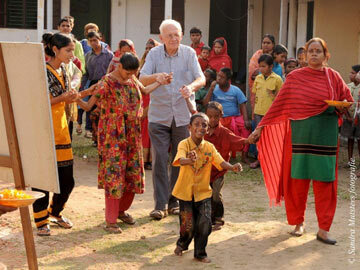 On January 16, Brother Frank, the brother in charge of the fraternity in Mymensingh (Bangladesh), died in his 79th year. He was born in the Netherlands, in the village of Gasselte in the province of Drenthe. After studying languages, he entered the Taizé Community in 1960. For a long time he had a weak heart, and then lungs. Recently he felt worse and a rapid return to Taizé was decided. A nurse accompanied him. During a stopover in Istanbul he suffered a heart attack; he was hospitalized and died almost immediately. His body was brought back to Taizé, where his funeral took place on January 21 in the presence of his five siblings; he was the eldest. A lifetime of self-giving for the poorest of the poor has come to an end. Whatever the place where he spent time along with other brothers of the community, Brother Frank always gave priority to a life shared with the most abandoned, rooted in an intense search for God. At the end of 1964, Brother Roger asked him to make visits to the United States which led to the creation, in 1965, of the first fraternity on the American continent, in Wisconsin. From 1966 to 1971, he was in charge of a fraternity where a few brothers of Taizé and some Franciscan friars lived in a very poor neighborhood of Chicago. Then he spent a year with other brothers in Atlanta. In 1972, Brother Frank changed continents. He was sent to Asia and made visits in India, where he established especially the first relations Taizé had with Mother Teresa. He then visited Indonesia, Vietnam and the Philippines. 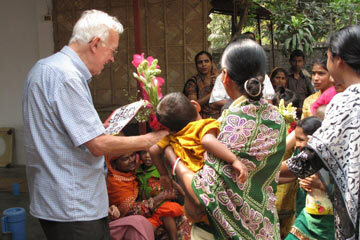 In late 1974, a fraternity in Bangladesh, one of the poorest countries in the world, began, in the city of Chittagong. From there, in 1978, he moved to Japan where, with other brothers, he began a fraternity in the marginal district of Miyadera in Tokyo. At the end of 1979, he helped begin a fraternity in Seoul, Korea, then he left for Calcutta in 1981, and returned permanently to Bangladesh in 1987. The brothers then went to live in the town of Mymensingh. We find that those who are rejected by society because of their weakness and their apparent uselessness are a presence of God. If we welcome them, they gradually lead us out of a world of hyper-competition to a world of communion of hearts. As a gesture of communion with believers of Islam or with other believers, we make pilgrimages together with the disabled. This opens up our hearts. When we serve together the poor and the weak, they are the ones who bring us together; it is not we, the strong, who do this, but it is they who invite us to be together, with them. 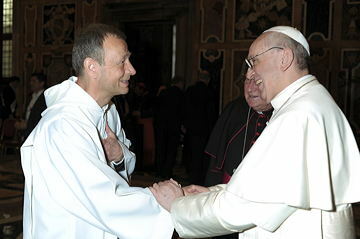 Brother Alois, the Prior of Taizé, was received by Pope Francis at the Vatican on Thursday, November 28. It was his first private audience with the new Pope. He had already been received each year by Benedict XVI, and before that Brother Roger went to Rome every year to meet Popes John XXIII, Paul VI and John Paul II. Brother Alois spoke to the Pope about the welcome of young people in Taizé and the pilgrimage of trust that the community is undertaking with young people on all continents. He also presented to the Pope the ecumenical concerns of Taizé, highlighting that baptism already unites all Christians. Pope Francis expressed the deep respect he felt towards Brother Roger, the founder of Taizé, and strongly encouraged the community to continue on the road on which it is engaged. 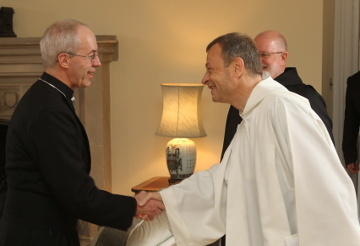 Brother Alois was in Canterbury on 21st March for the enthronement of the new Archbishop, Justin Welby. The next day he had the opportunity to greet him personally. During his sermon the Archbishop said that the church continues to have the power to transform society. Preaching to 2,000 people inside the cathedral and millions more watching and listening around the world, he spoke about how fear imprisons us and stops us from being fully human. Drawing on the story of Christ beckoning the disciples to walk on stormy waters, he recalled Jesus’ words: "Take heart, it is I, do not be afraid." Archbishop Justin said that "our response to these words sets the pattern of our lives, for the church, for the whole of society." In Rome, in St. Peter’s Square, in the middle of the huge crowd of Romans and pilgrims from many countries, I was very happy about the first words of Pope Francis. We were expecting something new from this election and it happened. The origin of this first pope, come "from the ends of the earth," expresses the universal dimension of the Church. The name he chose evokes the joy and love of the poor that inspired Francis of Assisi and which, until now, have been at the heart of his life in Argentina. He draws from the faith of Latin American Christians his vision of the relationship between the people and their bishop. "Let us set out on this road: the bishop and his people," "a path of brotherhood, love, and trust between us," he said, emphasizing his mission as Bishop of Rome. Those who were present in the square were visibly impressed that the new pope, before blessing them, asked for their prayers, bowing down and maintaining a long silence. By asking to pray for his predecessor, Benedict XVI, he brought together continuity and the promise of something new. With the whole crowd present to greet and welcome him, I was touched that he widened our attention to a worldwide dimension by saying: "Let us pray for the whole world so that a great brotherhood may arise."